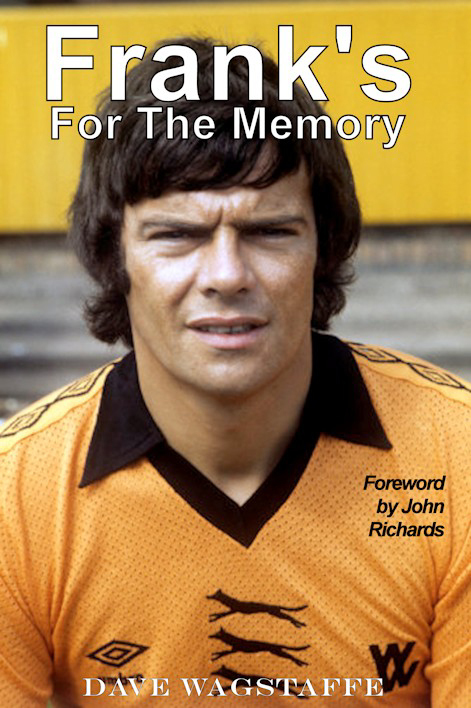 The front cover of a terrific posthumous tribute to two Wolves legends. Please note: This is a ‘working’ version only. A substantial case for Frank Munro having deserved a trip to the 1974 World Cup finals is made in Dave Wagstaffe’s revealing forthcoming biography of his long-time Molineux pal. 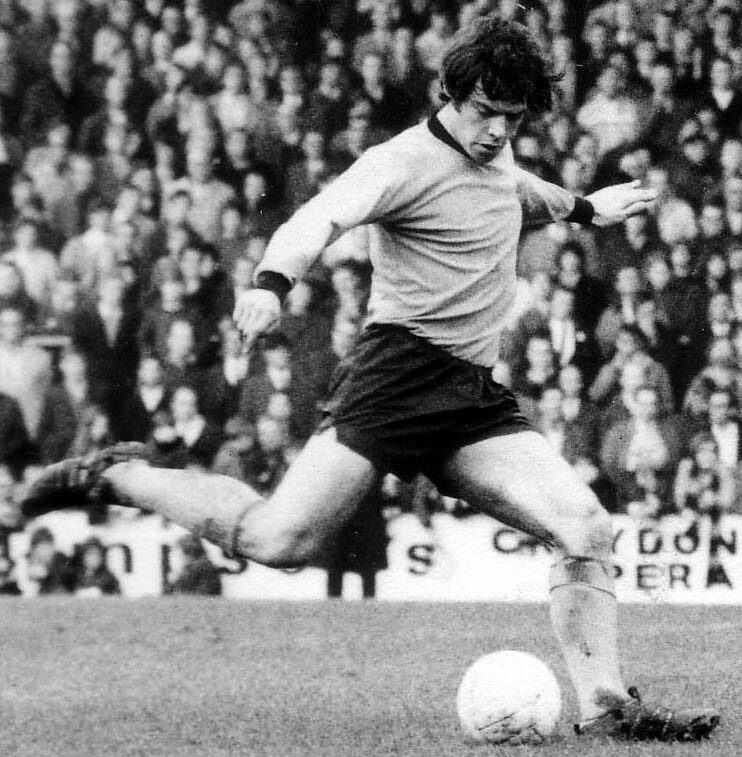 Many saw the elegant centre-half’s performance in that year’s League Cup final triumph as the pinnacle of a Wolves career stretching across 371 competitive first-team games and all but ten years. Certainly, his excellence in helping subdue a star-studded Manchester City attack started a clamour, led by John Dee in the Express & Star, for his inclusion in Willie Ormond’s squad for that summer’s tournament in West Germany. Further afield, Trevor Brooking, who was to play for England in the 1982 finals in Spain, spoke up for Munro in a big way when Wolves drew 0-0 at West Ham six weeks after their Wembley glory. 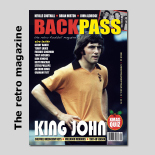 The Molineux boss described Jim Holton as not being a patch on his own no 5 but it was the Manchester United man who got the nod for West Germany, despite having played 34 League games as Tommy Docherty’s side were relegated. Wolves, with Munro making 36 appearances, finished 12th. Frank was named in his country’s preliminary squad but was overlooked for the Home Internationals and missed out to Holton’s Old Trafford colleague Martin Buchan, Leeds’ Gordon McQueen and Hibernian’s John Blackley for the other central defender slots available. Scotland suffered one of their heroic failures in the tournament, beating Zaire 2-0 and then drawing with Brazil and Yugoslavia. Well into the second half of the final Group Two games, they were on course to qualify before Brazil turned on the heat against the Africans to push the Tartan Army into third place on goal difference. Munro had been a team-mate of Buchan’s at Aberdeen, including at the 1967 United States tournament in which he so impressed Wolves, but the last of the four caps he had won up to the spring of 1974 had come away to Denmark in June, 1971, when he was strangely deployed at full-back. Clearly, the role he had played in helping take Wolves to the UFA Cup final in 1972, the semi-finals of the two domestic knock-outs in 1972-73 and to some cherished silverware the season after that had not cut enough ice north of the border, where a further demonstration of his prowess had come with his club’s conquest in the 1970-71 Texaco Cup. Five more senior caps would go Frank’s way – a mere fraction of the number many of those around Molineux thought he was worth – before he was finished. But the big honour at international level eluded him. And he has had a sympathetic biographer in Waggy, who is one of the best English wingers not to have appeared in a single senior international. The fruits of their literary labours, which have become a posthumous tribute to both men, will be seen in the second half of August, when the 208-page eagerly-awaited £14.99 hard-back hits the shelves thanks to the expert editing and research of Steve Gordos and the production work of Wolves Heroes’ sister company, Thomas Publications. Frank clearing his lines – instead of filling them! 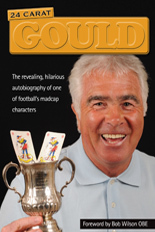 In keeping with Waggy’s superb 2008 autobiography, there are many humorous anecdotes, such as Frank’s somewhat cavalier attitude towards motoring laws, his fall-outs with managers and his enjoyment of the occasional pint and fag. To have your name, or that of a friend or family member, in a special In Tribute To Frank section at the back, all you have to do is buy your copy in advance. Please contact us here at Wolves Heroes by email or through ringing Thomas Publications on 07734-440095 to discuss payment arrangements. The deadline for subscriber names to be included is July 18. Regardless of the level of sales, we promise to hand £2,000 to the duo’s chosen charities and plan further donations if the book performs well. Please help us make the Munro and Wagstaffe families proud and ensure this project is the success it deserves to be. Posted on: Wednesday, July 2nd, 2014.